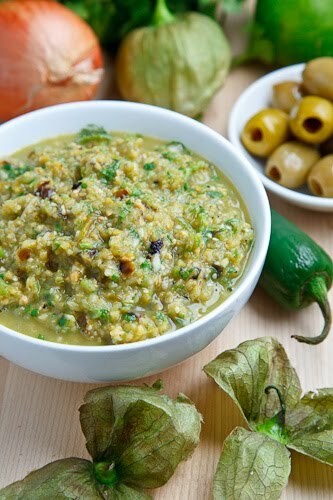 A roasted tomatillo and jalapeno salsa verde with green olives. I am finally back at home and just in time to share one last minute Cinco de Mayo recipe. A while ago a friend mentioned that Rick Bayless has a salsa that has olives in it and I was immediately taken by the idea with images of salsa verde with green olives dancing in my head. I am a big fan of fresh homemade salsa verde and I was thinking that adding olives to it would only add to the complexity of its flavour and to its robustness and I figured that Cinco de Mayo was the perfect time to try it out. For the recipe I went with my regular salsa verde recipe and added some green olives. I like to roast the tomatillos and the jalapenos in the salsa but I prefer the texture that the fresh onions add and the pungency that the fresh garlic adds so I use them raw instead of roasting them as well. This recipe is pretty much as easy as roasting the tomatillos and the jalapenos, pureeing everything in a food processor and then you are good to dig in! I am definitely glad that I tried adding the green olives to salsa verde as the combination is magical! Before I knew it I was already halfway done the first batch, decimating it with tortilla chips and snacking, and there was still something else that I wanted to do with it! If you are looking for more Cinco de Mayo recipes, take a look at my Cinco de May Pinterest board. 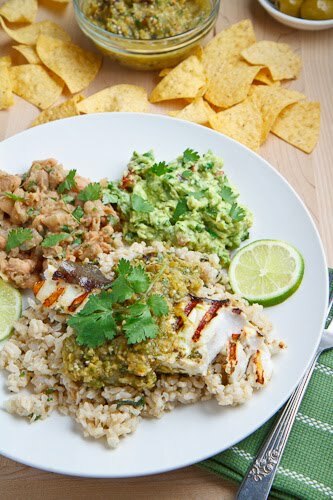 I was pretty sure that the green olive salsa verde would be excellent with fish and I decided to serve it over some cilantro lime grilled halibut (see below) on a bed of cilantro lime rice along with aside of jalapeno refried beans and guacamole . As it turns out the the green olive salsa verde is excellent with fish and it made for one truly tasty meal that I will definitely be doing again! Place the tomatillos and jalapenos on a baking sheet and broil in the oven until they blackened all over. Place the jalapenos in a small seeled container such as a ziplock bag, let cool for 20 minutes and pinch the skins from them. Halibut that is marinated in a cilantro, lime and jalapeno marinade and then quickly grilled until just cook and still nice and moist and tender. Marinate the fish in the cilantro, lime juice and zest, oil, jalapeno, green onion, garlic, cumin, salt and pepper for 30 minutes in a sealed container in the fridge. Oil your grill or grill pan and bring it to medium-high heat. Grill until just cooked and no longer translucent, about 2-4 minutes per side. A perfect combination! So mouthwatering. I just posted a Gazpacho Verde today and was debating whether or not to put olives in it. After reading your post I wish I had! I love the idea of using this with the grilled fish. I love the idea of adding briny salty olives into the salsa verde flavor mix! Genius. Sounds like another winner, Kevin!